The challenge at Whimsy this month is anything as long as its festive! I have chosen to do this very festive image from Stamp Art Design called Christmas Candle.This digital file comes with the sentiment in English and french with the holly as well. I thought that it was very fitting given that Christmas is next week already. Wow has the time flown by, not really sure where the last month has went. Christmas already, then we are jumping into 2013. You should hope over to the Whimsy blog to see all the other great creations by the other digital designers. If you have created a card that follows the criteria then you should enter your creation for a chance to win some really great digital images from Whimsy stamps by Whimsy's Fabulous designers. I hope that my creation helps sent you some inspiration and a little festive Christmas cheer. This is a close up of the digital image that I colored with copic markers and added a few stickles for some Christmas glitter. 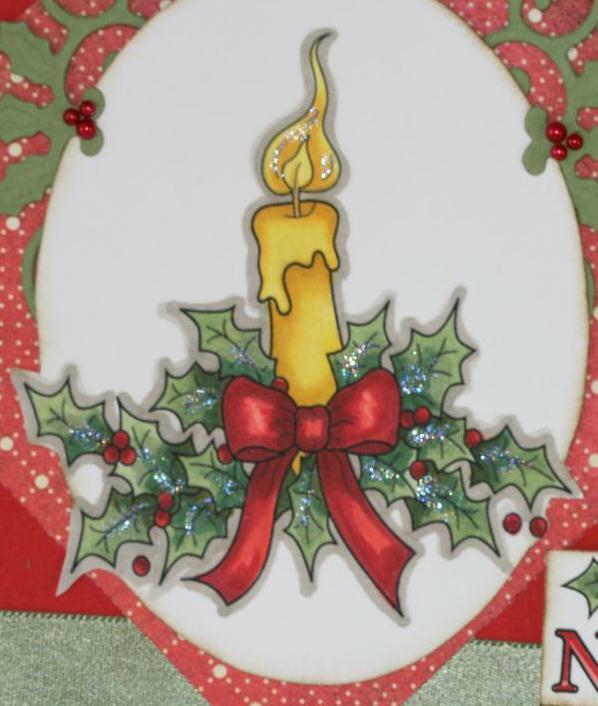 Supplies: Christmas candle digital image from Whimsy Stamps, copic markers, Oval & Holly Motifs spellbinders, Making Memories patterned paper, Bazzill cardstock, ribbon, distress ink, Kaiser Craft pearls, Ranger stardust Stickles. Thank you for stopping by to have a peek at my blog. 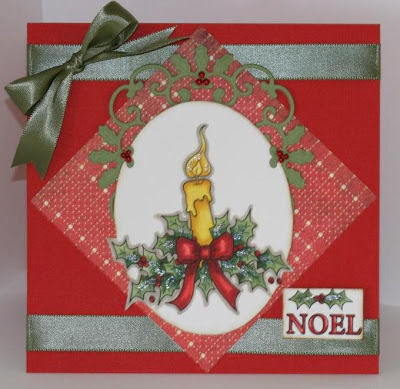 Nice card, love that image, very festive for sure...great job!